Profits from the sale will go to the new Prince’s Countryside Fund’s Emergency Relief Fund, which aims to raise £1 million to assist farmers who are struggling in the current financial climate. The money raised from the auction will be fast-tracked to farming charities; they have been under pressure from scores of new cases across the livestock and arable sectors. Jon Day, Event Director for Cereals, said: “We are delighted that Case IH has decided to use Cereals as the venue for this high profile and very worthwhile auction, centred on an iconic tractor brand name. It is great to see a big multinational like Case IH pulling out all the stops for farmers in trouble”. Supporting the event, auctioneers Cheffins have volunteered their services, which will include alternative ways for non-attenders to bid as well. Charles Blessley, UK Marketing Manager for Case IH, added: “Cereals is a not-to-be-missed show for arable farmers, and therefore the obvious venue for the auction of our silver Magnum. It is heartening how Cereals and Cheffins have rallied round to help us support farmers in need through the Prince’s Countryside Fund”. The limited edition Silver-liveried tractor is based on the flagship 374hp Magnum 340, and has been produced at Case IH’s factory at Racine, Wisconsin to mark 25 years of Magnum evolution. 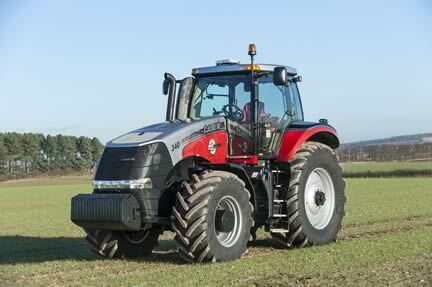 In a test of large tractors published recently by Farmers Weekly the Magnum 340 model was singled out for its strong engine and efficient automatic transmission, while being highly rated for its fuel consumption, linkage lift capacity, hydraulic power, load capacity and turning circle.